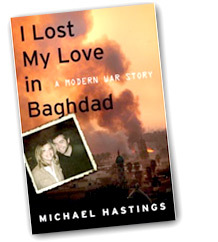 As a tribute and memorial to Andi, Michael Hastings has written a book entitled "I Lost My Love in Baghdad: A Modern War Story." A significant portion of the book's proceeds are going to The Andi Foundation. For author appearances, click here. "There's a long tradition of young reporters going off to wars that test their journalism skills and their capacity to absorb emotional pain. Michael Hastings's pain was off the charts, but he manages to tell his story -- and the tragic story of his girlfriend Andi -- with dignity, humor, and grace. This is a searing personal drama and a raw, compelling account of the daily battle to cover the war in Iraq." "Love and war always make for a potent brew, and in Michael Hastings's new book they infuse the horror in Iraq with an immediacy and a poignant sense of loss that are light-years away from the numbingly remote headlines we've been reading. This is what really happens when love, youth, and innocence descend into the abyss of death and devastation that is Iraq."